Now, listen up... LISTEN UP!!! Before you get all fired up and ragey at us, we want you to remember that you have five offensive categories to win you meat-heads. FIVE. You can draft Bryce Harper or Mike Trout number one all you want, but we all know that every other dope in your fantasy league is overly-enamored with the home run. Everyone loves a good long-ball hitter... until a guy like Billy Hamilton or AJ Pollock comes along and beats you single-handedly in steals, then you lose that week 6-4. Look at AJ Pollock's stats, one by one: they're all significantly above average - even his relatively-modest 20 HR and 76 RBI are enough to get him drafted in any fantasy league. 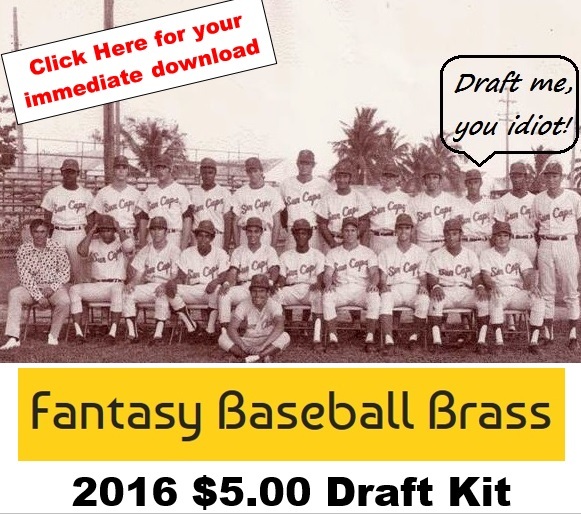 In fantasy baseball, you can't draft based on guys that only hit the for power. I mean, you can, but it rarely works out the way you think it should. Sure, a home run also counts as a run and at least one RBI, and it's even a hit that improves your batting average. Hell, that's 4 out of five stats! But players who do it all are guys who fill up the box score every game, and they drive the power-only owners in your league crazy because they think, "Pollock's nowhere near as good as Bryce Harper!" yet he just keeps piling up the stats, game after game. Guys who do it all are typically less-prone to slumps, therefore, they do something in just about every game - a run, a sac fly RBI, a stolen base, a couple of hits even if he doesn't drive in or score a run. All that stuff helps. Then when he does go deep and goes 3 for 4 with 2 runs and 4 RBI and a stolen base, that makes your team tough to beat every single week. Still, though... Bryce Harper is awesome. The lack of stolen bases is the only thing keeping Bryce Harper from the top of this list, but his power numbers are too great to ignore. Click here to read our 2015 Outfielder Rankings Archive. Is Bryce Harper still worth a first-round pick? Of course he is. "That's a clown question, bro." Don't be afraid to take Bryce Harper in the first round. Would we rather you find a guy who can go 30/30? Of course. But Bryce Harper is still a 40+ HR guy who's bound to drive in more than 100 runs if anyone on the Nationals can screw their heads on straight and/or stay healthy in 2016. Also, if you end up having to pull the trigger on an all-power no (or minimal) speed guy early on, you can still find some stolen base guys later on in the draft. Kevin Pillar will be available past the 5th round in most leagues (or for well under $10 in auction drafts)... then there's always the last-ditch, panic speed pick of Rajai Davis who can come in and steal 30+ bags for you if he's healthy. Hell, Rajai Davis even hit 8 HR in 112 games last year, and he still managed to steal 18 bases. Nonetheless, we don't want to dissuade you from drafting Bryce Harper early on. The dude hit .330 for Christs sake. Expect 40+ HR, 100+ RBI and 100+ Runs out of Harper again in 2016. We also expect he'll still hit over .300, but we're not gonna bank on .330 again... unless he does it again - then we'll bank on it next year. And, in all honesty, Bryce Harper is young enough and fast enough to steal 10+ bases - he just doesn't do it, or his coaches don't give him the green light to steal. 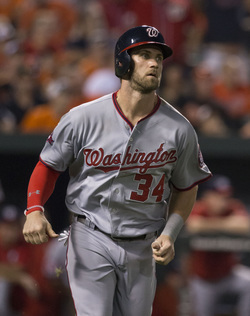 As a 19-year-old rookie, Harper stole 18 bases in 139 games, so the speed is there. Last year, Harper hit 91 singles and he also walked 124 times. That's 215 opportunities to steal second base, in theory. With Matt Williams gone as Manager of the Nationals, but one of Williams' mentors, Dusty Baker, as the new manager, we're not sure if Bryce Harper will be stealing any more this season. Regardless, Draft Harper because he helps in 4 of 5 categories, and if he starts stealing bags again, consider yourself lucky. There's not much to tell you about Mike Trout, other than the fact that he's starting to abandon his speed game for the power game... but whatever, man. He's such a fantasy stud, it doesn't matter. Our only concern with Trout is still that he strikes out way too much, leaving him prone to week-long slumps. Those week-long slumps from your top player can mean an extra loss that leaves you out of the playoffs, or, even worse, a first-round loss in the playoffs in your fantasy league. Still, man, draft Trout without fear. He's good for 40 HR, 100 RBI, 100 Runs and a .280-.300 average. He may even surprise you with 20+ steals again, but expect around 10 SB. Putting Yoenis Cespedes at #9 was actually quite a debate. One, great year does not make you a fantasy stud, but Cespedes' tools are just too much to ignore. On one hand, he's 30 and he just finally had a breakout power year in 2015, and part of that was the adrenaline spike of being traded to a young, energetic tea on their way to the playoffs. We also see consistency with his previous years as opposed to the ridiculous hot-streak he had with the Mets where he hit 17 HR in 57 games. Still, we don't see a way he stays under 25 HR this season, but we also don't see him hitting over .280, either. He'll fill up your Runs, HR and RBI quite nicely, but don't expect anything else. A typical age for hitters to develop their optimum power is 26. Giancarlo Stanton is finally 26 years old. Scary, huh? Think of that: this is the year when Giancarlo Stanton's power finally develops. F***ing ridiculous. So, blah blah, injury-prone, blah blah. You know all that. Still, Stanton hit 27 HR in 74 games played in '15. Average that out to a full season and you're looking at 55-60 HR. He also struck out 95 times, which would pan out to about 200 Ks in a full season. The good news with Stanton's strike outs: no one's afraid to pitch to him. Think about it: if you're a major-league pitcher, you'll take your chances with a guy who strikes out 200 times a year, thinking, "If I just don't leave one hanging, I'll strike him out." Because of this, he'll keep seeing pitches to hit this year... and because of that, and if he plays a full season, you can absolutely expect 45+ HR and 100 RBI out of Stanton. If he gets hurt again, well... we'll drop him in the rankings next year. For this year, though, at age 26, we see a big year ahead of Giancarlo Stanton. Because he was hurt most of last year, George Springer almost made the Sleeper Picks category... but he's too good for that. No one's going to forget about him on draft day. George Springer is a legitimate 30/30 threat, and now he even has Carlos Correa in the lineup. BTW, the Houston Astros' lineup is stacked from top to bottom, and Springer is right in the middle of it. The only thing you may have trouble with is whether Springer hits in the 2 spot or the 4 or 5 spot. You'll want to keep an eye on him in Spring Training to see whether the Astros need his speed on base after Altuve, or if they need his bat to drive in runs. Remember, they also have Carlos Gomez - another 30/30 threat - so it all depends on who takes the speed role and who takes the power role. Either way, Springer is a lock to hit 25 HR if he stays healthy, and we think he will. If he ends up in the 2-spot, expect 90 Runs, 25 HR and 80 RBI. If he ends up in the cleanup spot, expect 80 Runs, 30 HR and 100 RBI if he's able to play a full, healthy season. Lorenzo Cain is in a great spot: World Series champions, a lineup around him that just badgers pitchers by putting the ball in play, always someone in scoring position in front of you... Lorenzo Cain seems to have put his health issues behind him, and he's coming of his best power year and his second-straight .300+ season. More importantly, his 16 HR was no fluke, nor were his 28 steals (two-straight years with 28 SB). Hes 30-years-old, he's 6'2", 205 lbs, and the lineup around him has finally matured both physically and mentally so that there's no extra pressure on his shoulders any more. Expect 15+ HR, 90+ Runs, 80 RBI, and 20-30 stolen bases out of Lorenzo Cain this year while the Royals compete for another World Series championship. Say what you want about Ryan Braun. We're not asking you to like him, but we are recommending you draft him. He's (allegedly) roid-free and he had a great season in 2015. We've made the argument before with Barry Bonds that roids don't help you hit the ball, they just help you hit it farther. Ryan Braun is a talented athlete, roids or not, and he proved it last year by hitting 25 HR and stealing 24 bases in 140 games. Now, keep in mind that the Brewers are kind of a mess all the way around, but they have a hitter-friendly park and they have a couple of serious power threats behind Braun in the lineup in Khris Davis and Chris Carter... both guys swing like blindfolded windmills, but they're both back there as a threat to drive in Braun. But... because the hitters behind Braun are so strikeout prone, you can expect Braun to keep stealing bases. Look for a near-exact repeat of Braun's 2015 season in 2016: 25 HR, 25 SB, .280-.295 bating average and 80-90 Runs and 80-90 RBI. He'll also have at least one stint on the DL, but while he's healthy, he'll help your team across all categories, whether you like him or not.